At the beginning of each year, many of us are looking for some structure to guide our times spent with God. So I am starting my year of book reviews with an overview of daily/weekly devotionals. There are nine books in total; I have three favourites which I mention below. But I am sure that each one of these books could be a blessing to a large number of people, aiding as they will in the discipline of daily encountering our Lord Jesus in His Word. Format: Daily readings, 1 Jan to 31 Dec.
Several bible verses per day according to a theme, followed by a short devotional reading. Book design: Presentation page, attractive design with linen cover and stitching, ideal gift..
My personal opinion: One of my three favourites. An ideal book to wake up to; very pretty and has a good feel, daily readings are primarily scripture. Format: Daily Readings, Jan 1 to Dec 31. For women. 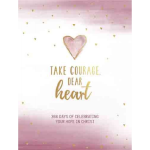 Every page contains a bible verse relevant to the theme of courage, as well as a devotional reading and prayer. Written by: Milanie Vosloo, author, speaker, businesswoman and mother. Book design: Presentation page, attractive design with gilt page edging, ideal gift. Format: Daily readings, Jan 1 to Dec 31. Verse by verse journey through Psalms, with a daily devotion and short prayer. One Bible verse per page, with a longer passage as a ‘To Read’. Selected readings are essentially in sequence, taking you through the Bible from Genesis to Revelation, each reading being a chapter or less. The daily commentary brings the Bible passage to life. Writer: Jill Briscoe , well known author of more than 50 books, speaker and Bible teacher. My personal opinion: Another of my favourites. An excellent aid to journeying through the Bible in a year. Verse by verse through the book of John, with devotionals by legendary preachers and Bible teachers including Charles Spurgeon, John Wesley and Andrew Murray. Includes: Short bio of each of the 15 contributors. Personal opinion: The third and last of my favourites; an in-depth look at a particularly interesting book of the Bible, with profound commentary by classic Christian writers. Format: Daily readings, Mon to Fri.
Each week has a brief introduction to a woman of the Bible. A study then follows under the headings Her Story, Her Life and Times, Her Legacy in Scripture, Her Promise, Her Legacy of Prayer. 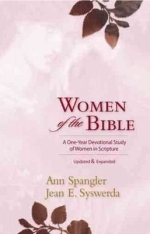 Written and compiled by: Ann Spangler, author of many best selling books, including Praying the Names of God, and Jean E. Syswerda, former editor and associate publisher for Zondervan Bibles, where she was involved in the production of various women’s Bibles as well as a devotional guide to the Bible. 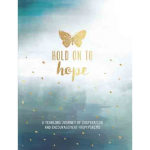 Includes: some interesting lists – All the Women of the Bible, Women in Jesus’ Family Tree, Women in Jesus’ Life and Ministry, as well as a Timeline of Women of the Bible. Also has an Index of Background Topics. Format: Weekly readings, one year. 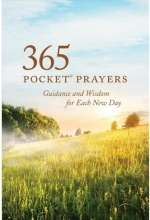 Each page contains a bible verse, devotional reading and prayer. Written by Holley Gerth, author, life coach, counsellor and speaker. Format: 30 topics, each based on a Bible passage, with three to six relevant devotions, one per page suitable for daily readings. 121 days. 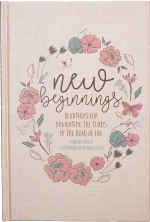 Written by: Carolyn Larsen, author and speaker with a passion for ministry to women and children. Book design: Presentation page, attractive design, ideal gift. Format: Day 1 to day 365. Themed prayers followed by a scripture verse /short passage. Aims to deepen your prayer life. Thanks for this John – great idea. My address is 313 Villiers Rd Walmer 6070. They look good, thanks. Seeing the previous comment about Our Daily Bread, I’d like to confirm it… I receive them on the internet and they’re SO relevant and beautifully presented. My mother used to read them even when not a committed Christian, in the late 60s and 70s, then gave her heart (and Dad did too) to the Lord in 1979… and it became her daily bread. It kept her going!